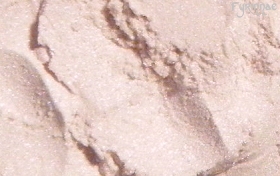 Satiny ivory-pink in the jar, but once applied, it is a soft glow of pink shimmer. Apply over a black base (shadow, liner, lipstick) for a great effect. Swatch applied on bare skin.